The Achievements system is awesome! This post could also be titled “I’m never going to run out of things to do”. Upon loading into WotLK for the first time – and oh, I was bouncing in my chair! – I set about checking out some of the banner items for Wrath of the Lich King. Unfortunately, Inscription and the barber salons haven’t been implemented into the game yet; the next thing that caught my eye was the new Achievements system. I’ve long wanted something like this, some way of measuring all the things us explorer-types (and rabid completionists) do for kicks. Star Wars Galaxies had badges; Lord of the Rings Online had titles; WoW had… nothing. Until now. 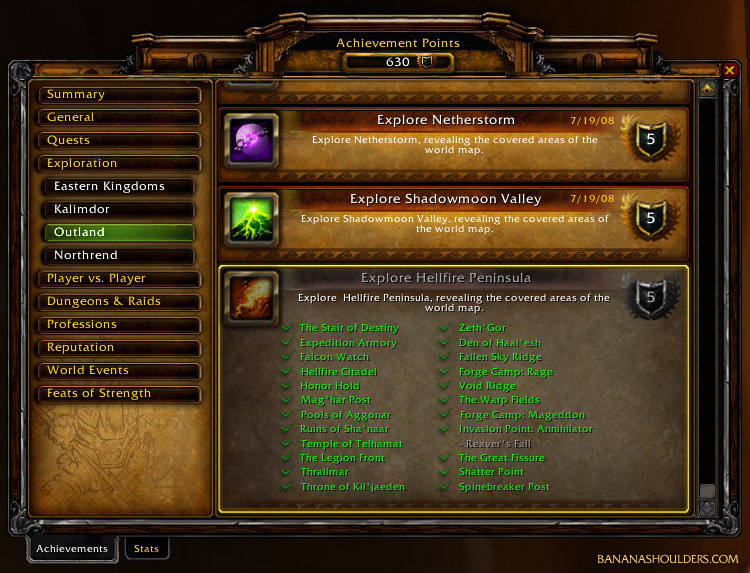 You can find the button to access the Achievements interface on the mini-menu, between your Talents and the Quest Log. This opens up a pane which, to be honest, doesn’t entirely fit the style of other WoW interfaces. You can see the general gist of the system; though; the front page is a summary showing you what you’ve achieved recently, and some fun stats. From there, you can explore all the different achievements; it will show you the ones you’ve already gained, and the ones left to accomplish, along with a summary of what you need to do for it (if it’s not obvious from the name). For instance, apparently I missed a map area in Hellfire Peninsula. Who knew? I’m really pretty happy with this – it takes nothing away from people who aren’t interested in “meaningless” achievements like these, but it’s great for those of us who enjoy exploration and developing a character. I’m told there will be ways to show off your achievements to other people; I’m not sure how that’s done, yet. I’ll edit this post when I know. I’m sure there will be complete lists of achievements and how to gain them up on WoWwiki within days of release – many of them are there already!, so I’m not going to go through them all here, but anyone who’s interested is welcome to ask and I’ll happily answer questions. Awesome first content post for Wotlk… Really whets the appetite. The achievement system looks very interesting, and I’m happy to not know EVERYTHING about it straight away, although what I’d love to ask in generalised terms is, Does it look like it’ll keep us amused for -ages-. 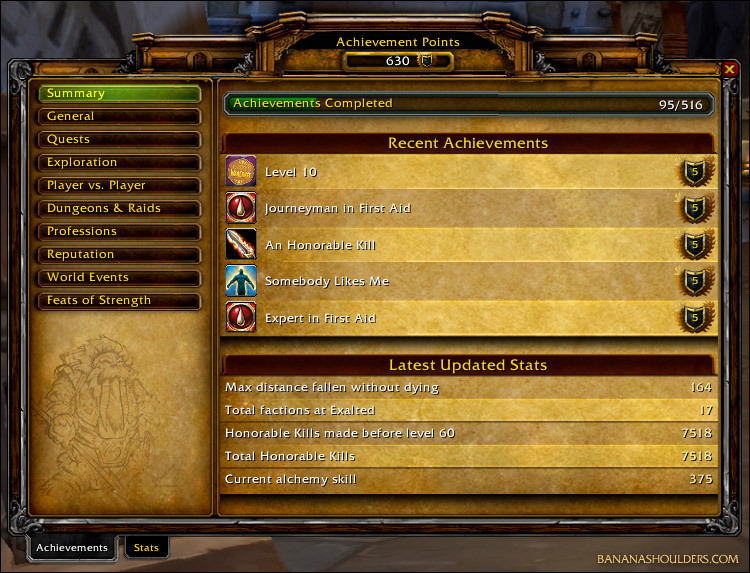 Are there achievements that some classes, or factions just NOT finish (thinking to the tabard aggravation) will they have account wide achievements (as in, 3 horde toons and 2 alliance toons which collectively through class, race and tradeskill selection done EVERY achievement in the game) or do they only show the ones your race/class/tradeskills can complete? Will it be possible to race through them, or will it literally take MONTHS? Ohh, this makes me happy.